Sitting atop Waldorf Astoria Las Vegas, this jewel box serves the celebrated French fusion fare of its namesake master chef. Dinner Tues.-Thurs. 5:30 p.m.-9 p.m., Fri.-Sat. 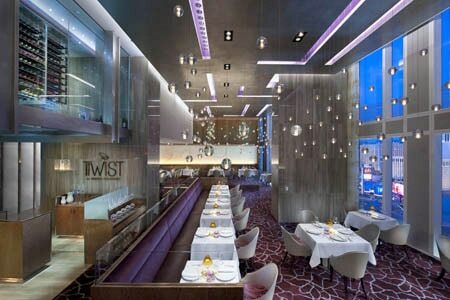 6 p.m.-10 p.m.
About the restaurant and décor: Nestled away on the twenty-third floor of the luxurious Waldorf Astoria Las Vegas, Twist by Pierre Gagnaire provides an extravagant dining experience as well as an oasis of serenity. The design mixes elegant white cracked-eggshell walls and scattered, suspended pearls of illuminated bulbs while 20-feet-high windows overlook the action of the city skyline. The restaurant is small by Las Vegas standards, with only sixty seats (plus another sixteen in the private room), but the intimate size of this jewel box ensures consistent quality. About the food: Chef Pierre Gagnaire, a French fusion cuisine pioneer, has continued his remarkable run of restaurants with Twist, his first venture in the U.S. Spot-on presentation details include artfully plated canapés and waitstaff provide synchronized service. We suggest opting for a tasting menu, though there are also items available à la carte. Options include a five-course tasting ($185, plus additional Discovery wine pairing $95 or Grand pairing $145), six-course tasting ($205, plus additional Discovery wine pairing $105 or Grand pairing: $160) and the Lucky Number 7 (seven courses and seven wines for $777). Vegetarian tasting menus are also available. Dishes reveal themselves in waves of textures and tastes; their true potential often only slowly begins with the first bite, but after the fourth sets you on a quest for further experimentation, depending on which components you mix and match. Such may be the case with the foie soup with squid, black garlic, red currant, blueberries and turnip. Main courses could include Dover sole fricassee, Iberico pork chop roasted with sage, and A5 Japanese Wagyu garnished with corn purée, spinach, pomme dauphine, pickled onions, ravioli of beef cheek and bacon powder. Among the desserts, diners might encounter a Latour cake of Manjari chocolate biscuit, cheesecake and praline mousseline, hazelnut crunch and blackcurrant sorbet. About the wine: The impressive wine selection is housed in a dramatic glass-enclosed loft above the dining room. 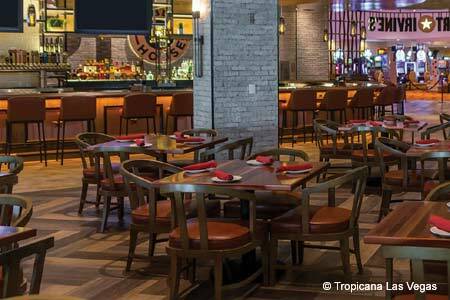 There's also an array of vintage and signature cocktails, plus non-alcoholic specialties.